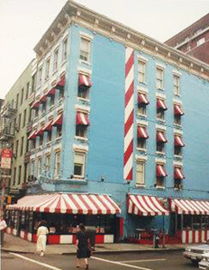 Friday's started on the Upper East Side of Manhattan where it helped introduce the Singles Bar and casual dining. 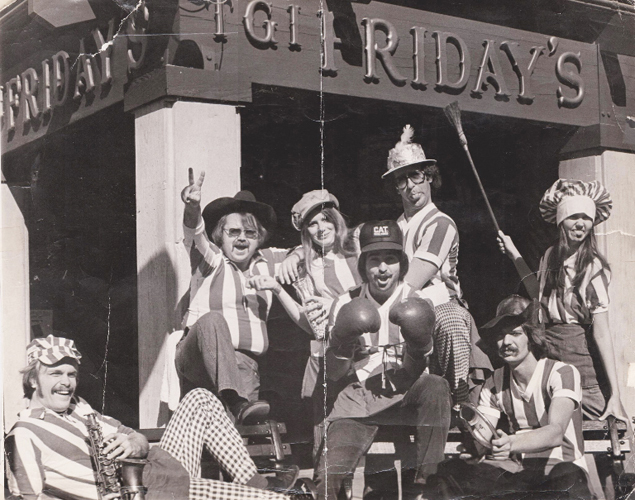 Other locations opened up until some investors bought the concept, formed a corporation, and opened up the first 'Corporate store' in the singles party section of Dallas - Old Town on Greenville Avenue by NorthPark Center in January, 1972. Liquor-by-the-Drink had just passed allowing restraunts to serve mixed drinks. 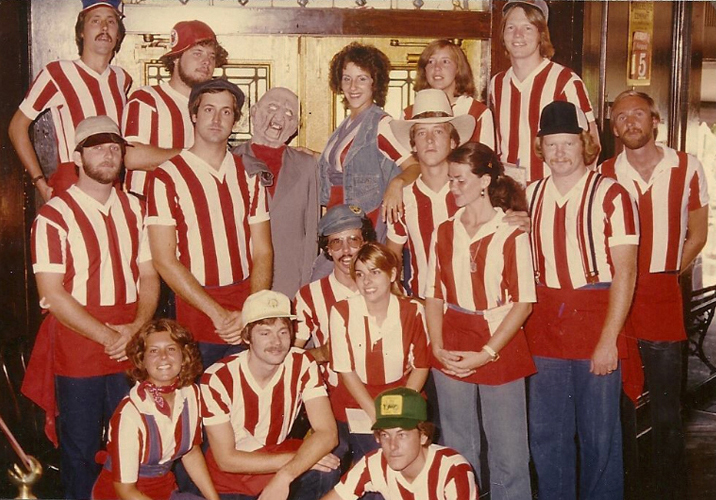 In 1975, when I decided to become a self-employed designer, I got a job as a server at TGI Friday's restraunt (spelled the way we say the word) in Dallas. I needed a regular paycheck to get me through the lean years of starting my design business. I enjoyed the work (except for the occasional rude customer). 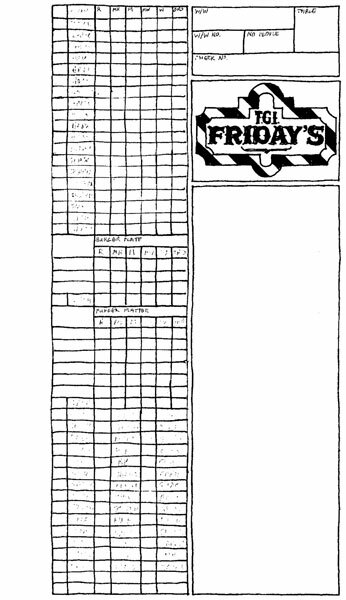 Working at Friday's was a great experience - I made some great friends, had some great times, and learned some valuable life lessons. 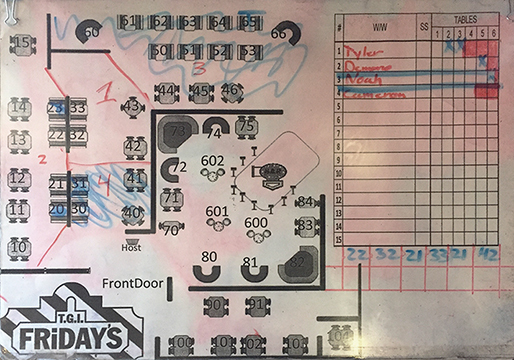 While helping open the new store in Marina del Rey (Los Angeles), I revamped the floor plan that was used to assign servers to specific stations. Servers can learn any system. They work enough shifts, they'll get it down. One time, we experimented with naming tables after people. One section was movie stars, another sports figures, etc. We servers finally got it but we often had to refer to the plan where we wrote in the names and we misdelivered food. But, heck, it was fun. The easier a system is to learn and remember, the more efficient it is to train new servers. 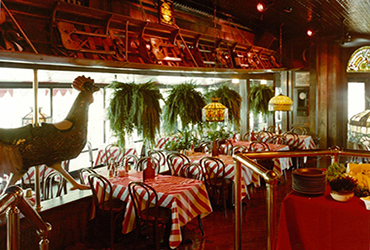 Food runners are often temporary and transient - servers in training, people pitching in during a meal rush, and novice servers. An easy to learn system takes less time for a trainer to teach and for one to learn. 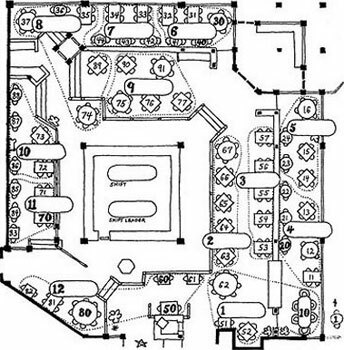 The existing floor plan numbered the tables in sequence beginning with number 10 and looping around to number 48. The outer cafe sections were lettered A to L in one section and AA to NN. No logic - just a unique number or letter for each table. Tough to learn and tough to remember. • The existing system used no logic or consideration for the new employee. • The numbers didn't have to be consecutive. Numbers could be skipped between sections. • The point of reference should be the entry from the kitchen to the dining area (the star in the above map). The new system requires one to learn only the lead tables (which are numbered in tens digits from 10 to 60) and then count as they walk down the row from the kitchen. For example, to deliver food to table 44, one goes to the lead table 40 at the head of the row, and counts the tables from there until arriving at 44. The lead tables are sequenced in order from the starting point of the kitchen (where all food runners will be coming from). 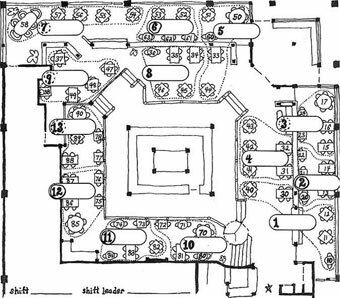 When I proposed the new system, I posted floor plans for reference at the bus stations and at the kitchen delivery area. Some servers moaned about having to learn a new system. I planned to be at each shift to monitor the transition. It turns out that the servers picked up the new system in about a half a shift. They all agreed it was easier and made more sense. 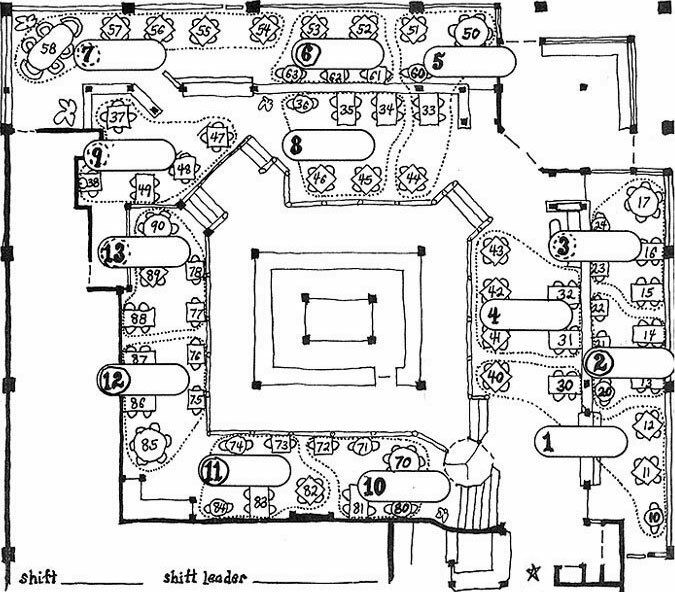 Friday's adopted the system in all their restaurants and many use the floor plan renderings shown below. I now notice that many restaurants use this numbering system but I don't know if they borrowed the concept from Friday's. • Logical sequence table numbers require less education to learn. • Station sections are easier to spot. • Server names can be written in the capsule shapes on the plan. 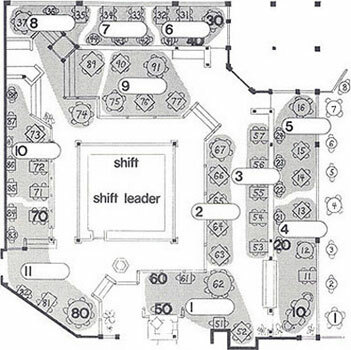 • There were blanks to fill in the Shift and Shift Leader. Start each row with a table ending in a 1. A row of 8 tables would be numbered 41-48. That way, the 4th table down the row would end in number 4. That makes even more sense and is even easier to learn and use. While on the road opening new stores, I didn't have any drafting equipment (and this was well before computer-aided design) so the floor plans were originally hand rendered. 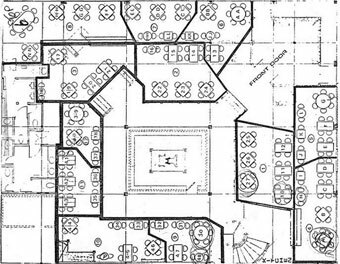 I would tape paper to the hotel or restaurant window and use that as a light table for tracing the new plan from the architectural blueprint. Above left: Stations denoted by dotted outline. 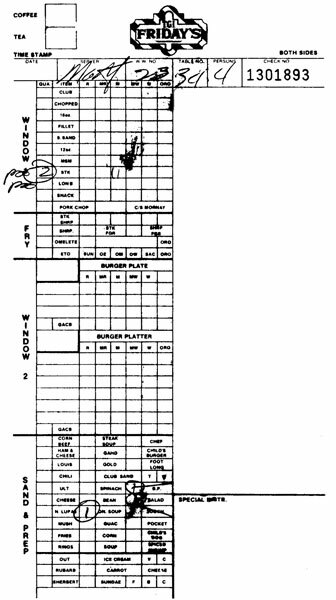 Right: Stations denoted by grey mass, different font, and more space to write in the Shift Leader's name. 1. Simplicity. A ticket should be clear and easy to understand by servers, expediters, cooks, trainees, and customers. 3. Efficiency. 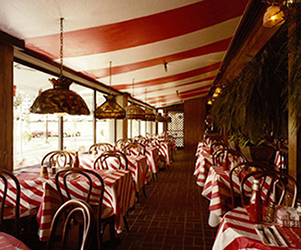 Aids the smooth flow of the food ordering process: marking, ringing up, cooking, and expediting. 4. Appearance. The ticket should be graphically pleasing to the customer, reinforce the Friday's brand, and enhance the experience. 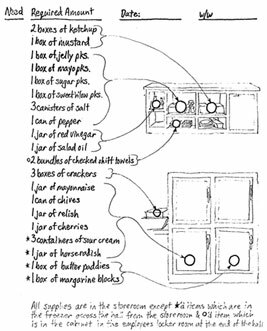 • Special instructions (these cause the greatest miscommunication with the cashiers, cooks, and trainees) are written in the left column, next to the item involved. Here, they are easier to see and write and are not hidden by overlapping ticket in window or while ticket is in the cash register. The location avoids having to add lines and arrows on the ticket. • Info for the cashier is grouped together. • Large table number in the right hand corner facilitates easy and quick comprehension. • Menu items are grouped in logical efficient order. The drink register in the Service Bar was a chaotic jumble of items. 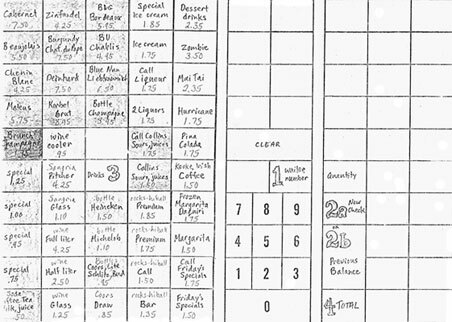 The above layout is designed for the novice or trainee - there are large and highlighted numbers for the steps one must use to enter information and the most popular drinks are aligned along the bottom row, in line with the 'Total'. Observing servers using the register showed that many used the bottom of the register as a benchmark support for their hand - it was a simple matter to hit buttons from that vantage point. Drinks are grouped by type: highballs together, wine, beers and the drink categories are color coded for easier locating. At one point, I worked as a corp rep who would go to a store to spot weaknesses and help the general manager improve efficiency and training. I often conducted training sessions on how to be a more efficient and effective server, including a history lesson on Friday's and a pep talk. I would also make suggestions to the manager about improved store appearance and operation - as simple as moving the broom and dust pan out of view from the customers to rearranging the layouts at the service bar or expediter station. 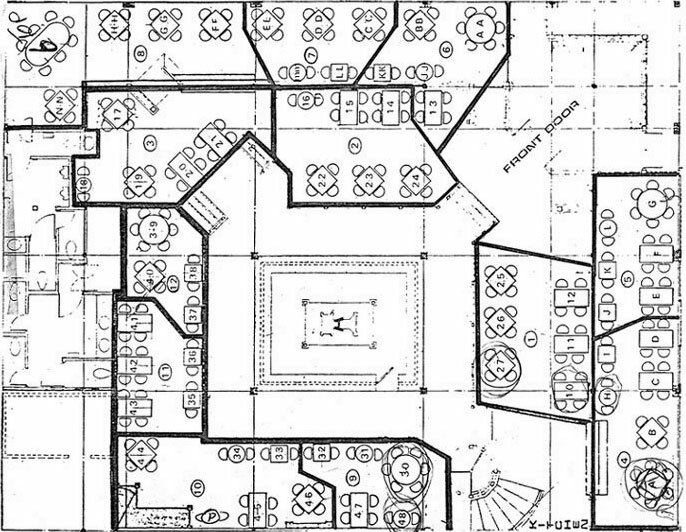 The renderings above were for an improved layout of items in the expediter station in Tampa. These were posted at the station so the person stocking could have a guide. In the 1970s, during slow times when door staff was not on duty, a crude handwritten sign was propped up on a bar stool inside the front door - Please Seat Yourself. A server brought the menus to the table. 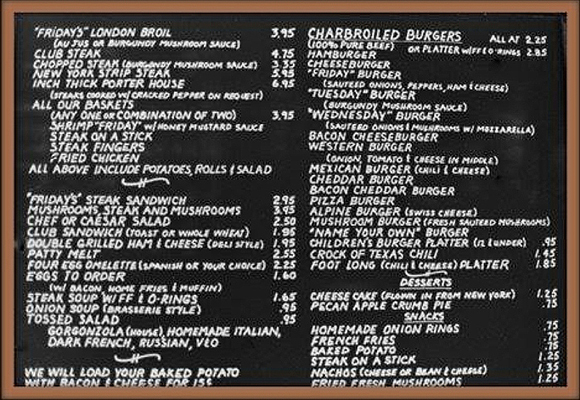 I proposed a menu box at the front door that contained menus and allowed people to take and begin reading the menu before the server approaches the table. This minimized the perceived wait times. The concept was approved and funded. I designed and ordered the custom-made boxes in a Victorian style to match the decor of the restaurant. The copy on the box read, "Please take a menu and seat yourself." 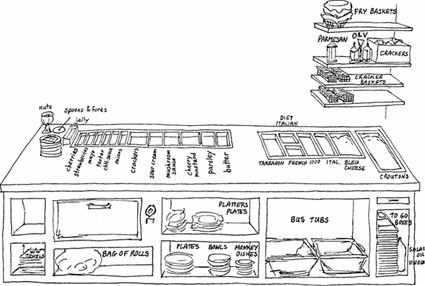 Servers would set their tip tray on the counter for the cashier to ring up. During meal rush times, the trays backed up waiting on change. Many checks needed no change - they were charges or the customer left the total amount - the ticket just had to be rung up. I couldn't see why those had to get in line and delay those needing change back. So, I set those trays to the side, away from the incoming queue of tip trays, yet still within sight and reach of the cashier (green dot above). I would tell her, "No rush" so she knew to ring up the other tray totals first (red dot). I can still see the face of gratitude on the cashier for making her job less stressful and on the servers who got their change back faster. The head cashier asked the manager to make it a company-wide procedure. 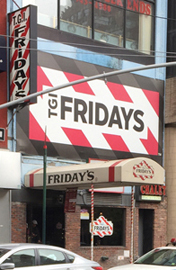 Also at Friday's, I worked at the door as a Host. When we were on a wait list, we would take names and then call them on the PA when their table was ready. Instead of saying "Mr. Watson, party of 4." (as the Corporate Office requested) I would say "Mr. Watson, your table is ready." While waiting to be seated, the Watson's don't care how many are in their party - they are wondering, "when will my table be ready" so that's what we should tell them. See from the waiting customer's PoV - empathize with them. OTLE (pronounced OH tull): Option to Leave Early. It was never an option, it was the manager sending home some w/ws when the lunch or dinner rush ended. Mike Albers, Jan Fair, Tom Sand, Rico Fantini, Mark. 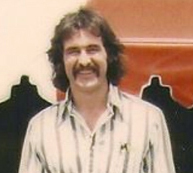 Thomas Boggs, my favorite General Manager. 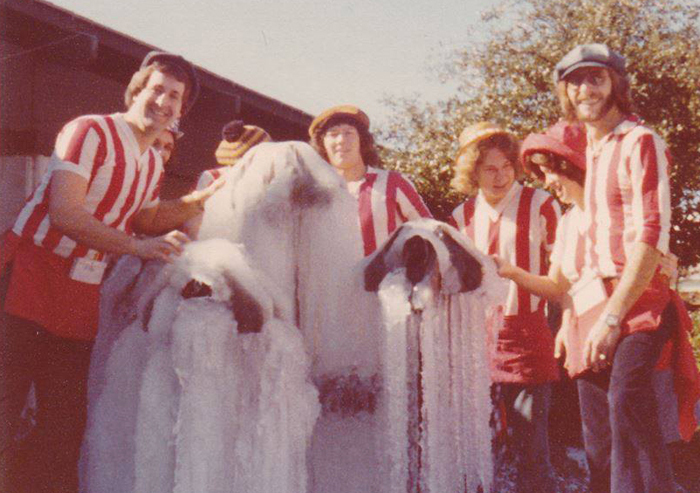 Calvin, Steve Wray, Sue Ragsdale. 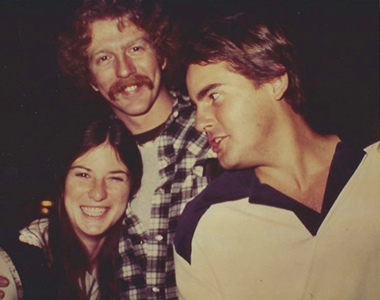 Sue, Wild Bill, and Mike McClure. 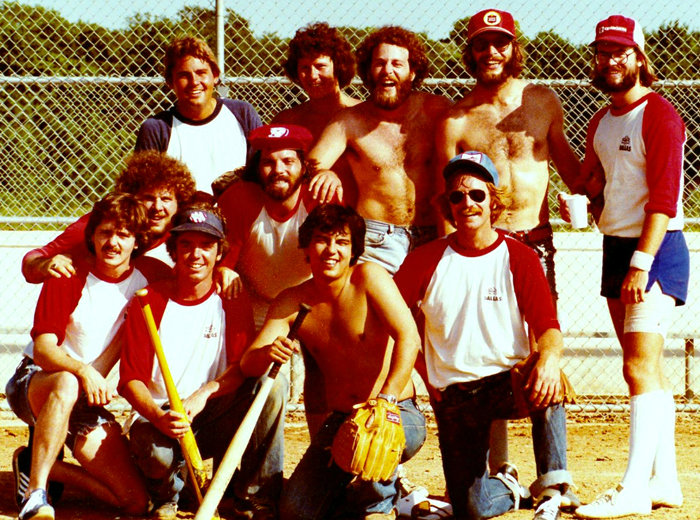 Greenville Ave baseball team: Jimmy West, Mark Hershkowitz, Paul Curran, Mike McClure, Barry Crook, Danny Carter, ?? Dennis Norris, Steve Robinson, 2 can't-remembers. Danny Carter, Mike McClure, Steve Robinson. 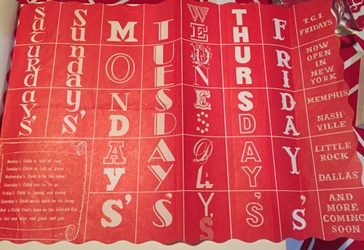 Below: Placemat and early slate menu, Dallas, mid-1970s. 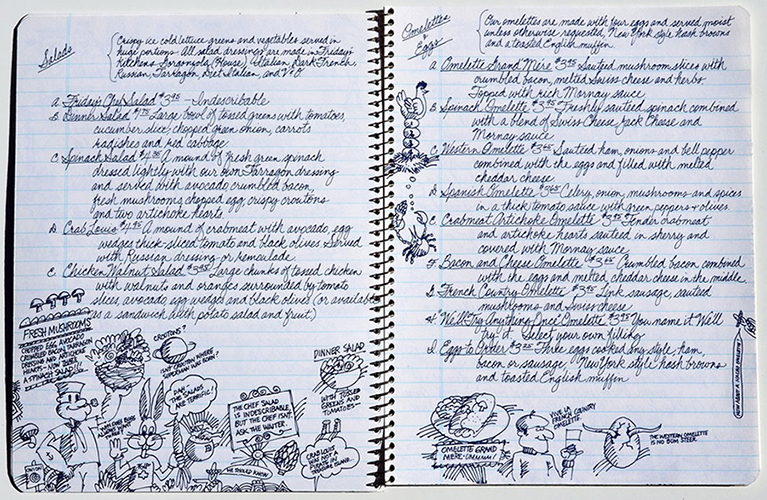 Soon after, the menu grew into a bound booklet with an overwhelming number of items. After helping out in the Louisville store during the Kentucky Derby, Nora and I drove the TGIF van to our next opening: Ft. Lauderdale. On the way, we stopped at Mammoth Cave in Kentucky. 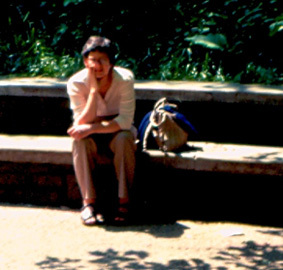 That's Nora sitting at the entrance. After opening the Ft. Lauderdale store, we took a short trip over to Jamaica - Lenzy Griffin, Brad Nelson, Lee Ann Malina, Jim, Nora Hughes. After that opening, our Opening Team split up: some went to work at other locations, some went home, and Nora and I drove the TGIF van to the Atlanta airport so Nora could catch a flight to Boston. I drove the van back to Dallas on I-20. I picked up some hitchhikers to help with the driving. 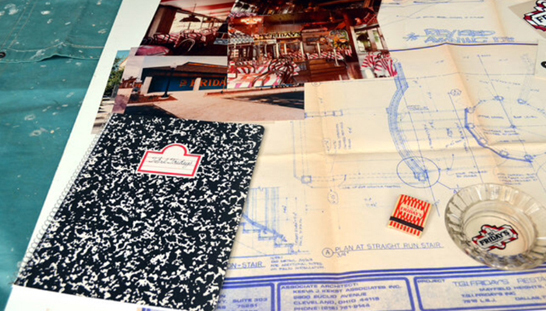 A promo photo of the Cleveland (Mayfield heights) opening materials.